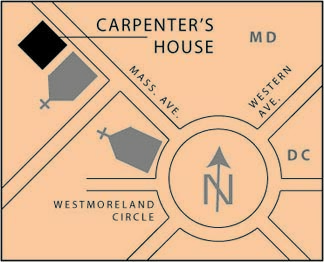 The house is on the DC/Maryland state line, about 100 yards north of Westmoreland Circle, which is where Massachusetts Ave. and Western Ave. intersect. It is just north of the Washington Baptist Church. If driving, look for the Washington Baptist Church on the west side of Massachusetts Ave. (not Westmoreland UCC which is on the circle one block south). Turn into its south entrance and continue around the church. Past the playground, bear right. 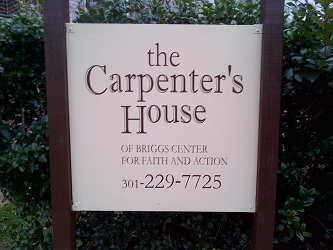 You will see several parking spots between the church and the Carpenter's House. The “N” buses from downtown DC go to Westmoreland Circle. Montgomery County Ride-On buses also service the area. Copyright 2011 The Carpenter's House. All rights reserved.